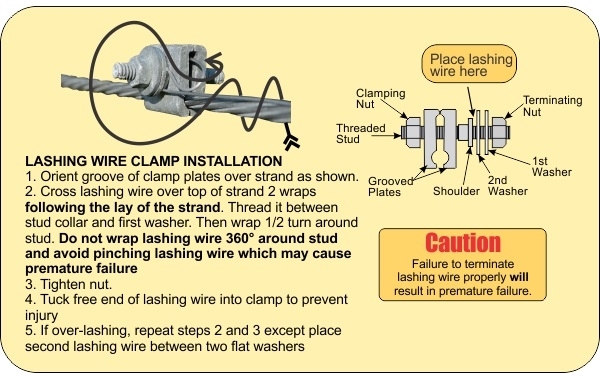 Perfect for temporary and permanent terminations or grounds, this all steel clamp lets you securely attach two lashing wires or #6 ground wire on any size strand from 1/4 to 7/16 in. (6-11 mm) diameter. Two grooved plates fit on opposite sides of the strand. 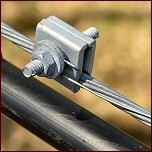 Plates secured by a threaded stud with a flanged shoulder and washer to block slippage, and two hexagonal nuts: one on the long end of the stud to tighten the clamp, one on the other end to terminate the wire against the two washers. A mechanical galvanized finish provides extra corrosion resistance.